PICTURE USUALLY IS!! Had I not figured out how to move it down I would have LEFT IT THERE!!!! 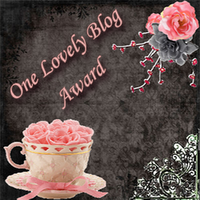 I actually moved the award to the right place on my blog!!! MY HUSBAND THOUGHT WE WON THE LOTTERY I YELLED SO LOUD WITH JOY!! He even came over to give me a hug because he could see something had brought me great JOY!! Anyway- for all you computer geeks out there, I can stamp, but I CANNOT do these simplest of computer things without great frustration and usually without success!! I probably will never be able to do it again, but hey, I did it once!!! Please don't be jealous of me all the rest of you computer losers like me.....just rejoice with me!! Okay, about that card we just went by.....I posted it on SCS yesterday and alot of people said Wow, another black magic card, and it is NOT black magic. That is emboss resist. The way you do that is you stamp the flowers on your white card stock circle. Color them however you want to color them. Now paint them with a versamarker and clear emboss. Now they are masked and you can stamp on top of them, or you can smear ink over them, (gable green in this case) and draw some white gel pen accents on top. Michelle Z did this with me a couple of years ago and I use it constantly now - it's almost as addic ting as Black Magic!! So try it and have fun and let me know if you have any questions!! I promise to do a tutorial on it one of these days.....I promise. things about myself that you didn't know so here goes, at least I can do THAT much....(oh and it was a Laura Van Vleet I believe who was so kind to nominate me for this award......1.) I am blog challenged. No, you don't understand, I mean I AM REALLY BLOG CHALLENGED!!!. 2) I have 7 grand daughters and no grandsons and that's okay, I am BLESSED BEYOND MEASURE 3.) I love my golden retriever and my husband and kids and not necessarily in that order 4.) I work as an office manager for a very nice dentist and love it 5.) I play the guitar once in a while when I'm not stamping 6.) I love Jesus and HE loves me and 7. 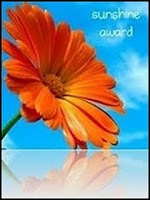 )Did I tell you that I not only won a major award but I MANAGED TO DOWNLOAD IT TO MY BLOG???? DID I TELL YOU THAT??? CAN YOU PLEASE TELL YOUR FRIENDS????? OH HAPPY DAY.......Until next time, keep on stamping!! LOL...I will certainly rejoice with you, Karen! I haven't ventured into blogland yet because learning to put a watermark on my cards (even with help from tutorials, online advice, etc.) took me FOREVER! BTW, we have a golden retriever (it's actually my daughter's dog, but when she's home from college, Bear comes with her and we claim him, too). They are sooo lovable and sweet! that is awesome Karen - Congrats!!! You so deserve it though - your cards are gorgeous:) I hope to one day get an award, but honestly, I just started my blog yesterday, so I have to practice for a while still - LOL. I'm glad you were able to download it too - that is a big step (I just learnt all that stuff too). My Mom used to tell me the very same thing! I think it's OK to Toot your own horn every once and again though and getting a blog Award is something to be proud of so Toot away my friend! 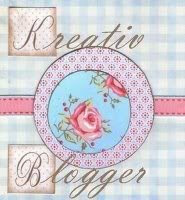 I have enjoyed you over at SCS and have now become a follower of your blog! 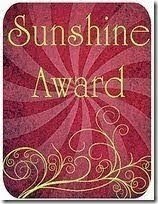 Congratulations on your Award Karen you sure do deserve it, your work is FAB-ulous!! Oh, and btw you only listed 7 things!! lol! I'll do the happy dance with you!!! A real accomplishment for you. Congrats! Love your new cards! I so had to grin when I read your explanation of trying to post the blog award. My blog is a continuing challenge to get my very old brain to wrap around new technology, so I rejoice with you to see that blog award sparkle on your sidebar. Karen, congrats on the award and excellent job figuring out how to post it on your blog!! I'm very technology challenged as well, so I empathize with your struggles. I want to say I came here today to check out your Black Magic tutorial and it is wonderful, I hope to use it with my Vintage Vogue flourish as you did today on SCS. What a wonderful technique and a brilliant idea to use the white gel pen! I also read a few of your posts and can identify with your spiritual struggles. I was really touched by how you overcame many years of spiritual "drought" and it has given me some food for thought. Congrats on the award. Your cards are beautiful, stunning, pretty -- just amazing. Love them all!! ROTFLOL! You are one funny lady! I love your blog! 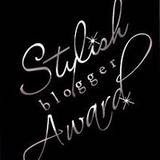 I have another award for you on my blog! Let's see if you can do it twice....I'll be watching and waiting! LOL! Toot on, yay! This computer-challenged grandma certainly understands. Your cards are incredibly beautiful, and the coloring beyond amazing. I would just like to request you tell a little more about which set or ingredients or techniques you used. They are so gorgeous by the time you get done I have a hard time recognizing the stamps! Loved the black magic with white tutorial! Thanks so much. Congrats on your award. I am a Creative Memories Consultant and enjoy scrapbooking very much. I also am really into Tatting. I started Scrapbooking in 2001 and Tatting in 2006. It is so much fun doing a hobby and then in return receive award for it. Congrats again. Your creations are beyound amazing, Karen! I am truly inspired by your fabulous creations! I recently did your black magic tech! Just loved it! Thanks for sharing and for all the inspiration!